‘Zeke looked around him. Ahead, seemingly for miles, stretched rows and rows of books—shelf upon shelf, layer upon layer, rising as high and as far as the eye could see. 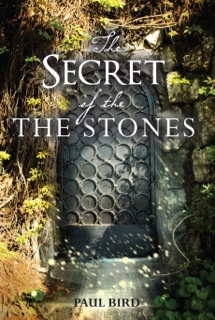 He stepped forward and the floor creaked beneath him. As he looked down, he saw polished floorboards and, stretching along the vast walls, leather couches and seats with small green reading lamps. There were the familiar scents of wood and leather and the musty smell of an old library. “What do you mean?” asked Zeke. Zeke moved forward. Apart from the size, the library felt like the old place in Tenterfield that he had visited when he was much younger. He approached one of the shelves and reached out to touch the books. His hand went through them, and he realised that they were not real. They were images, projections, somehow made to look as if they were books. “So it’s all fake?” said Zeke. “None of it is real at all.” He was a little disappointed. “But could I walk all the way to the end?” asked Zeke. Zeke thought for a moment. He did not want to embarrass himself by getting a comic to appear or some random book that he had been reading at school. Instead, he thought of something that his father had told him about and that he had looked at once. In a moment, a large book appeared in front of him. Paul is an ordinary kid with a lot of headaches. There’s a killer snake in his backyard, a bully who won’t go away, a bullrout that haunts his favourite creek and a bad, mad, cranky rooster. 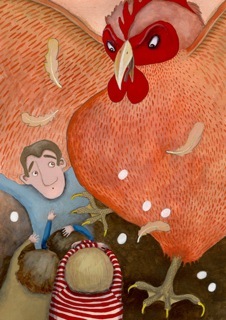 In The Mad Rooster, Paul Bird tells uniquely Australian yarns, hilarious and action-packed. I grew up in Newcastle and spent much of my spare time making up adventures at the nearby creek and swamp. Most were based around yarns that my parents had told me about their childhood. These tales kept us enthralled. They told of a time when things were so different and exciting. They were part of our history, but as time went on I was sad to see that they became dim memories, fragmented through time and neglect. After I moved to Sydney in 1999, I started writing again. Determined not to allow the stories to fade, I kept a diary and pencil in my bag, using any spare moment to write. But the stories stayed in that diary, needing a reason to emerge. ‘When I was in Primary School there were six boys named Paul in my class. Paul was a popular name back then, in honour of Saint Paul, and mothers and fathers hoped that their children so named would exhibit some of the unique virtues and qualities of the great Christian missionary and teacher. Unfortunately, they were largely disappointed—but we tried our best. So many boys with the same name presented big problems. If a teacher called “Paul!”, he or she got five responses simultaneously. This created enormous confusion as well as a lot of noise, as six Pauls responded loudly…To fix this problem, our teachers referred to us by our first name plus the first letter of our second name…this worked pretty well. 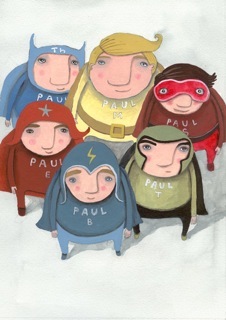 My name was Paul B, and the others were Paul T, Paul S, Paul Th, Paul M and Paul E.
Each of us had minor super powers. We could all do something unique that was special to us alone and hence we felt it was reasonable that these be referred to as super powers. Not fantastic super powers, like flying, super strength or web spinning, but mild super powers, super sometimes only in the minds of your mates. For example, Paul S could impersonate any teacher in the whole school. He could make his voice so convincing that you would swear that Sister De Porres was just around the corner, ready to spring us doing something she had told us not to do. Sister De Porres was the school principal. We all called her DP for short. She was mighty scary and her cry could be heard from one side of the school ground to the other. Paul E could do super-fast underarm farts that rose higher and higher, eventually squealing as they reached a high pitch. He had a fantastic ability to let one go just as the teacher had turned her back to write on the chalkboard, and then sit innocently, as if nothing had happened. Paul M could jump further than anyone in the whole school. Everyone wanted him on their team. Paul T had super strength; he could lift huge rocks and bits of wood. He was also a very good fighter, handy to have around if there was trouble. Paul Th was very good with his feet. He had an uncanny ability with a soccer ball and could balance on the tiniest of objects.